Eye On Golf: A Short Summer Reading List. A Short Summer Reading List. Summertime, for golfers, should evoke thoughts of rounds of golf and reading on golf. There is, as you undoubtedly know, a seemingly endless parade of golf literature which presents us with the formidable task of sorting out the good from the bad and ugly. So here’s a little help: three volumes that have recently come across my desk that should stimulate your golfing summer. Frank Thomas was the Technical Director of the USGA for over a quarter of a century and is today considered to be one of the leading experts on golf equipment. Thomas parted with the USGA in 2000 but hit the road with a briefcase full of knowledge and ideas. With that in tow he produced this book for those of us with limited technical understanding of the game we love. Thomas’s new book could easily have been entitled Everything You Wanted to Know about Golf Equipment: A Concise Education on the Tools of Our Trade. Obviously a bit cumbersome, but it does describe the book perfectly. Thomas delivers to us the science of the equipment world, but lays it down so that even technical mortals can get the gist. It’s a marvelous and comprehensive journey through the equipment world. You need this book if you have the slightest curiosity about your equipment. Fortunately, Dr. Dorsel is here to help us with a practical, yet non-clinical approach to our mental game on the course. I am a bit skeptical of written attempts to help me think clearly on the golf course. But Dorsel’s approach is heavily tilted to the practical side. He has divided the book into fifty lessons, instead of chapters, covering every aspect of the game. He even coaches you on what to watch for when you attend a professional event. Each lesson is clear and concise with barely a hint of psychobabble. While I have not tried this, I‘ll bet you could read a lesson, jot down the key points on an index card, and take it to the course. If you’re hoping to improve your game both physically and mentally this summer, let Dr. Dorsel work on your mind. A couple of years ago my latest volume Off the Beaten Cart Path was published. While that was becoming a highly successful volume in the realm of golf literature (well, almost), David Wood was trekking around the planet in search of the highest, lowest, most northern, most southern (and so on) courses that are actually affected by gravity. Let’s face it, almost every golfer worth his Titleist has fantasized about roaming the earth to play the great and famous golf courses. And a few of us have envisioned having a game at a few of the more bizarre layouts that we might encounter along the way. The latter was Wood’s dream. To make this financially feasible, he sold virtually everything he had and hit the road with ten clubs and a small suitcase. It’s a fascinating story of a love for golf and the characters involved in the game around the world. The great appeal of this volume is that Wood resists the urge to give us a play-by-play of every stroke of every round. Rather he tells the tale by introducing us to characters and courses he encountered along the way. It’s a great read for the hammock in the back yard after a morning round of golf. I’m sure Wood would like it that way. 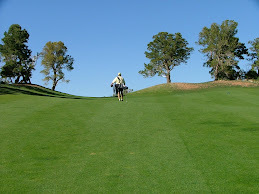 I’m working with Takkle.com, a social networking site that provides golf videos, photos, and a whole lot more. Takkle is a place where students, athletes, coaches, and fans can share their passion for golf and other sports. I feel that your site is very useful. I would love to know if you could link to our social networking resource.